In my previous article about inspiration, I talked about the trickiness with the common question, “What is your inspiration?” In that article, I did not state the actual influence behind my glass sculptures. For people expecting me to pin-point those one or two things that have had an influence on my work, then this second part is the article for you. Influence and inspiration for me has always felt similar to the “chicken or the egg” theory. Let me give an example of what I mean by that. Let’s say you’re in the mood for chocolate cake… and you want to make it yourself from scratch. However, you want it a little different than the usual chocolate cake. So, you search around for unusual cake recipes. 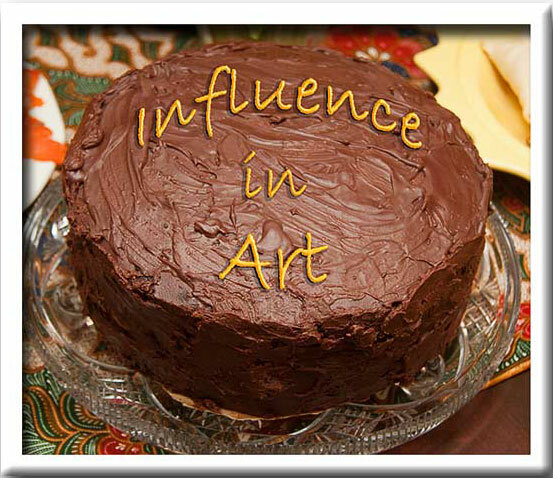 Some of the recipes “influence” you with ideas and direction for how you want your cake to be. That is the “chicken” part in the “chicken or the egg” theory. Now let’s say you weren’t even thinking about chocolate cake… but while doing something else, you just happen to stumble upon an awesome cake recipe. Suddenly that cake recipe “inspires” you enough to forget what you were doing in the first place and now you want to make a chocolate cake. That is the “egg” part in the “chicken or the egg” theory. What “influence” is, and what “inspiration” is, play very different parts in creative thinking. “Inspiration” sparks the fire, and “influence” steers the ship. Am I influenced by other glass artists? Early in my career, I was definitely influenced almost exclusively by other glass artists. Learning new techniques and just figuring out how to work with molten glass ate up most of my mental capacity. After focusing on the “craft” end of things, or the “Hey look, shiny thing”, I began later in my career moving away from utilitarian objects. The fact that my glass sculptures were made of glass wasn’t the most important factor. However, choosing a material for a sculpture is always a factor. The visual qualities that glass gives you as it plays with the surrounding light I feel have an impact and purpose for my work.